It’s late the night before Easter and you just realized you have no grass for the Easter baskets. Here’s a quick DIY Easter basket grass idea. Look through your stash of tissue paper and choose a color that coordinates with the basket you’re filling. 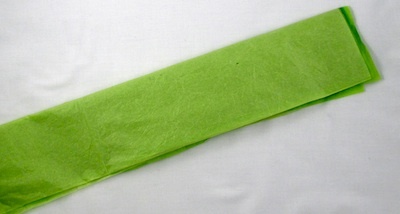 Tissue paper comes in such a rainbow of colors, you can find the perfect one for an Easter basket. Use a different color for each one. You can even recycle some used tissue paper since wrinkles won’t be noticed once the paper is cut and piled into a basket. And the great thing about tissue paper is that it doesn’t have the static issue that plastic store grass does. 1. If you have a large basket to fill, you can fold 2 or 3 sheets of tissue paper together to cut at one time. I used different shades of green, and I thought they looked good together. 2. Stack 2 or 3 sheets of tissue paper and fold 3 or 4 times the long way. 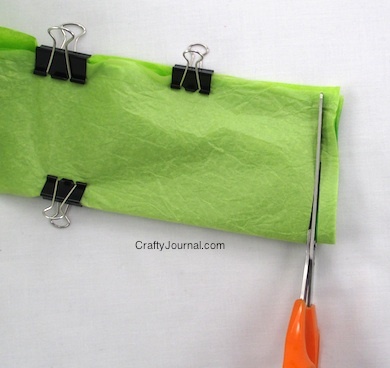 Use binder clips if needed to help hold the layers together. 3. 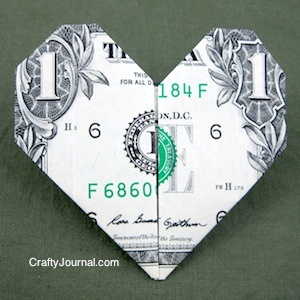 Starting at one end, cut narrow strips across the paper. Cut from the fold edge toward the open edges to help the layers stay together. But it won’t really matter if the strips aren’t perfect, because when they are all together in a basket, it won’t even be noticed. 4. After you have several strips cut, gently pull the layers apart and scrunch them up. Then add them to the basket and fluff them enough to fill the basket. Now add your other Easter basket items. 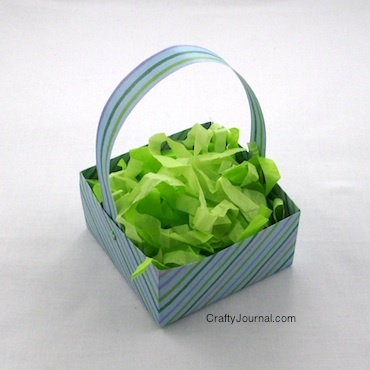 This basket is an origami Easter basket made with a 12 inch square sheet of designer paper. I cut 1 1/2 inches from the top and one side of the paper. I folded one of these strips in half the long way and glued it shut to make a handle. Tips for Making the Easter Grass. Tissue paper is cheap and easy to find – you can get a multi colored package at the Dollar Store. Or you can re-use some you already have. Wrinkles won’t matter because you’ll be scrunching the strands anyway. Kids can help cut the strips, and it’s great scissors practice. Of course, kids should always be supervised by an adult whenever using a sharp tool. Colorful paper can be run through a shredder, but be sure to clean any other paper shreds out first. And be sure the shredder is unplugged before you clean it out. you always have such brilliant ideas 🙂 this is a good one for sure! Great idea! I love how this looks! Much easier to clean up than the regular easter grass! Oh, I love this!! We will definitely have to try this next year. I bet the cats won’t eat it as much as they try with all the other Easter grass (and then get sick). Thank you for sharing at Sharing Saturday!! Thanks! This is a great idea that I will definitely use. This year for Easter I am making easter baskets, easter candy, and other easter gifts(to go in the baskets) for my friends, but there’s one thing I didn’t think through… ‘Where will I get the easter grass?’ And I can’t use the easter grass that we reuse year after year because it just barely fills all six of the easter baskets that we have. SO, this DIY is perfect! Thanks again for your creativity!